The Chesapeake Bay is a large, beautiful, and wondrous body of water. It is the largest estuary in the United States. It's role in the history, economy, and recreation of America is well documented. Sail nearly anywhere along the Bay and you will see the evidence of that in the many cargo vessels, recreational boats, and workboats operated by the famous Chespeake Bay watermen. 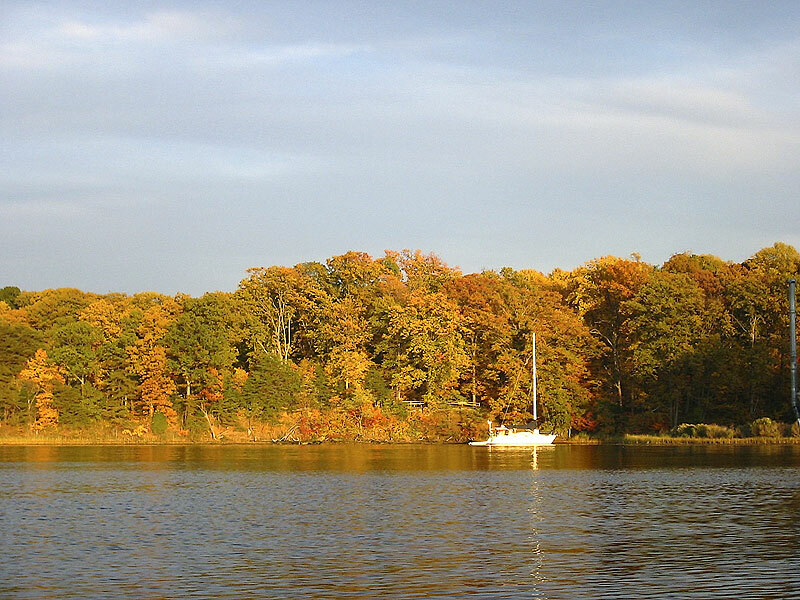 The size of the Chesapeake Bay offers its visitors limitless options for streams, gunkholes, and waterside towns. It is impossible to see all there is on the Chesapeake in one trip or even twenty trips. You will want to return again and again! Capt. 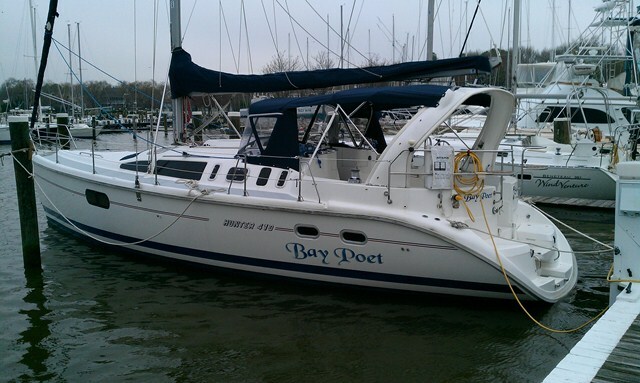 Rob frequently cruises on the Chesapeake Bay aboard his sloop, S/V Bay Poet. She is a beautiful, well-appointed vessel. Up to four people can sail Bay Poet with Captain Rob and Chef Theresa who sails as cook and mate. If you need a different yacht to accomodate a larger party or to visit a different cruising area, Rob is happy to work with you to find a charter yacht that meets your needs. Sail the Chesapeake Bay and see the beauty that draws Rob back again and again. Listen to him tell you the history and anecdotes that make the Chesapeake such a unique sailing ground. Later, at anchor, sing with him as he dispenses poems, songs, and music picked just for the moment. Capt. Rob keeps his boat at Haven Harbour Marina in Rock Hall, MD on the Eastern Shore. Rock Hall is one hour from Annapolis, two hours from Philadelphia, and about 4 hours from New York City. Rock Hall at first appears as a small, inactive town but look more carefully and you will find delightful coves, abundant wild life, a full-range of dining experiences and entertainment, and most importantly...easy access to the Chesapeake Bay. Haven Harbour is a beautiful marina with full services including a bar and grill, master mechanics, swimming pool and a B&B. Capt. Rob offers multi-day cruises aboard his boat. Bay Poet can accomodate up to 4 guests plus the captain and mate. On a 3 day weekend, it is possible to make it as far as Havre de Grace or Oxford, MD. For a two day weekend, all of the most popular destinations are easily within reach. If you want to stop in a town, Annapolis, Baltimore, and Galesville are all within a day of Rock Hall...or less. If you prefer the quiet and solitude of an isolated anchorage, we can visit the Corsica River, Harness Creek, or the Rhode River. There are also creeks with more activity like Fairlee Creek and the Magothy River. However, if you have a larger party or you want to start from a different location, Capt. Rob can help you charter one or more boats from Havre de Grace, Rock Hall, or Annapolis. For those looking to go even farther afield, charter yachts are also available in Solomons, MD and Deltaville, VA. 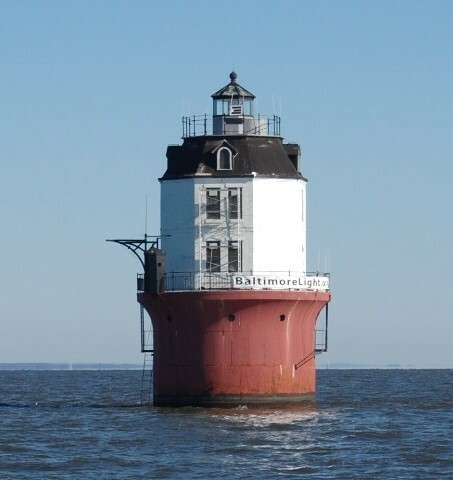 There is almost no place along the Chesapeake Bay and most of its tributaries that Captain Rob has not sailed. Additionally, Capt. Rob will work with you to plan special events or themed experiences. Are you celebrating a special event? Looking for open air music? Maybe you would like to have a wine tasting. Celebrations on the water are special because they are unique and intimate. Planning is what we do. Let Capt. Rob and Chef Theresa help you create something special. A two-day weekend charter is $1600 and a three-day adventure costs $2000. Prices are quoted for the entire trip with up to 4 clients and NOT per person. Included is the use of the boat, fuel and pump-out, provisions, linens, and of course, the Captain and a cook. All you need to bring are your clothes and whatever personal beverages you may wish. Weekend cruises on charter yachts in other locations will be priced based on the vessel you wish to charter, the adventure you wish to create, and the size of your party (maximum number determined by the layout of the yacht selected and the number of hired crew). We are sure that you will be pleasantly surprised at the cost AND the quality of the experience you will have with Captain Rob and Chef Theresa. Gratuities are always gratefully accepted. Capt. Rob and Chef Theresa will treat your vacation like their own! Send Capt. Rob an email now to find out what we can do for you. You may also call Chesapeake Flotillas at 908.672.3609.